The director of China's main disease control centre has resigned over an outbreak of the respiratory disease Sars at one of his laboratories. One person was killed during the April outbreak, which came a year after Sars killed nearly 800 people worldwide. The resignation is being seen as part of a push for greater accountability. China's leaders want its bureaucracy, better known for high-handedness and widespread corruption, to be seen to respond to public criticism. The official Xinhua news agency said Li Liming, director of the Chinese Centre for Disease Control and Prevention, had resigned for "mismanagement of the Sars virus" at the nation's most important infectious disease laboratory. 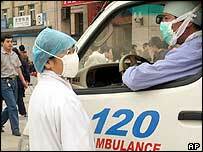 "Poor management of the virus triggered the Sars outbreak," Xinhua said, quoting sources at the health ministry. Four other officials were disciplined, Xinhua added. The BBC's Louisa Lim in Beijing says the case is the latest in a series of resignations by officials held responsible for disasters that could have been prevented. Mr Li's resignation follows the publication of a government report on the outbreak. China's media said the outbreak might have been triggered by scientists at the National Institute of Virology in Beijing experimenting inside the institute's laboratory. Parts of the institute and laboratory could have become contaminated, which would explain why people whose work did not involve handling the virus became infected, the Beijing News said.